WMHH BREAKING NEWS! Miss Scarlett had a sweet December surprise. While checking on Buddy Yahoo, who was convalescing in the Chick Inn after Bumble Foot surgery, Scarlett heard peeping from the upper level. Henny Penny, the ever broody hen, hatched seven baby chicks. This is a first time hatch but serial attempt at setting on eggs for Penny. 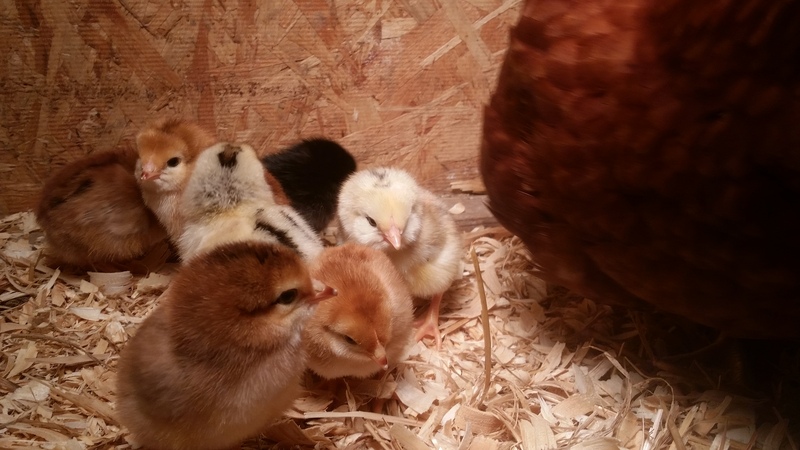 The gender of the new fluff balls is still unknown, but they’re hoping to add seven new laying hens to the Egg Plant. Mother and chicks are all doing great and have since been moved down to the Inn lower level, where scratching, dusting and bug hunting can be enjoyed.